Bloggers using the blogger platform normally blog in fear not to break or go against Blogger T.O.S which is having there post deleted along with it content, but now there should not be fear anymore because there now a easy way on how to backup blogger blog . Yes! it is totally possible, so no fear anymore to bloggers using this blogger platform. Now this blogger backup feature is a feature which was just added some months ago, called the Export Blog and your blog along with it content can be downloaded into a simple .xml file. So when you blog just disappeared from your dashboard without an excuse from blogger and you can contact them if you get no good reply you can just use the backup you have. Now this blogger backup which is saved in a xml format can be uploaded to blogger itself back or another blog or maybe you mistakely deleted some of your posts and want them back you can easily just upload the blogger blog backup back to the blog through another feature called the Import Blog. Once you have uploaded the file back then you post and what you may have deleted will be back up online. You can see the power of backup. A good blogger should always try to backup his/her blog like once every week , so incase anything happens one can easily recover back, By doing this and having your blogger backup with you all the time is totally necessary. I hope now you can see how important to know how to backup blogger blog ? Like I said before get this backup for your Blogger blogs, it is totally easily, just follow the steps listed below and you will get it easily without problem. 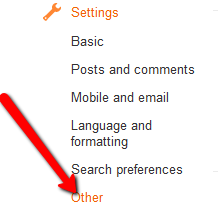 Login to your blogger dashboard, the blogger blog which you want to backup, below is an example of a blog I want to backup, click on the button at which the arrow is pointing at and go to the Settings of the blog which is the last on the list. Normally when I do this backup for my blogger blogs I normally put them in a specific folder and also back that folder up so I don’t get into problems when my computer crash. You should do that too to keep your blogger backup safe. So, Now you know how to backup your blogger blog, so do not waste any minute again, go straight to your blogger dashboard and download your blogger backup . I hope you do understand this post on how to backup blogger blog , if you have any question about this post. please use the comment box. Backup your blog and stay safe. Great tutorial Oluwadamilare. I will surely use this tutorial sometime on my website. Thanks for the tutorial. This is a great tutorial on how to backup blogger blog, will definitely share this for my blogger friends to learn from. Often it is considered you don’t need to backup blogs in Blogger platform. Google’s servers are much more reliable to risk the blog loss, but yes, your posts may get deleted sometimes if it violates the TOS. But it is better not to try to publish the post elsewhere which was against TOS. Although, I don’t use Blogger anymore but I will keep this amazing tutorial in my repository for future reference. I’m a great fan of blogger because it’s free and yes easy to manage. Taking backup regularly is most important in Blogger because we have no control over our blog as Google can anytime shut down our blog. Very solid representation and well described tutorial for blogger users. I am using a plugin for this purpose. I cant recall its name right now- but its simply superb!! Am having blogger blog and will follow your guide to backup it.